Smartly away under trainer Aidan O'Brien's son Joseph, the daughter of Galileo tracked the pace set by stablemate Soon and took over with two of the seven furlongs to run in the Group One contest. The 8-13 favourite never looked likely to be caught as Fire Lily came out of the pack to take second, a length and three-quarters away. La Collina had to settle for third. Maybe could now follow the same route as last year's Moyglare winner, Misty For Me, and head to Longchamp on Arc day (October 2). O'Brien senior said: "I'm delighted with her. Joseph had ridden her the last twice and knew what he wanted to do. Everything went right, so I'm delighted. She's very uncomplicated and she has the gears. "I suppose the option would be the French race (Prix Marcel Boussac) next, that's what we did with Misty For Me. All the options are there, also the Fillies' Mile. "She's progressive and loves her racing. She doesn't do much at home, she only canters because she is racing often. "With a filly with that class you have to think about it (the 1000 Guineas), but lets finish her two-year-old campaign first. Looking at her today you'd say a mile would be no problem." Earlier, O'Brien's Crusade showed plenty of improvement from his debut run at York to land the Mad About You EBF Maiden. Always prominent under Colm O'Donoghue, the Mr Greeley colt, sent off the 5-2 favourite, stretched clear in the final 150 yards to win nicely. O'Brien said: "We'll look at the Blenheim Stakes or something like that. We'll see how he is." Maybe is the 7-2 (from 5-1) favourite with Coral for next year's Qipco 1,000 Guineas, after the Aidan O'Brien-trained filly maintained her unbeaten record in Sunday's Moyglare Stud Stakes. Godolphin's Discourse is 7-1 second favourite, ahead of Fallen For You at 12-1. The daughter of Galileo is also Coral's 8-1 favourite for the Investec Oaks. "Although there are eight months to go until the first fillies' Classic of next year, Maybe continues to impress, and it will take something special from one of her rivals to displace her from the head of the Qipco 1,000 Guineas market. 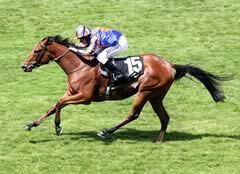 As a daughter of Galileo, she could also be the one to beat at Epsom," said Coral's David Stevens.